Returning from a two-week holiday, I was excited to open my mailbox as soon as I came home. I expected parcels, fan mail, magazines and postcards from around the world. You can imagine my disappointment when, upon my return from the Balkans in the first week of November, I only found one postcard from an autocratic, right-wing, nationalistic head of government. And I don’t even live in Hungary! Maybe I will receive a postcard from Vladimir Putin or Robert Mugabe next. 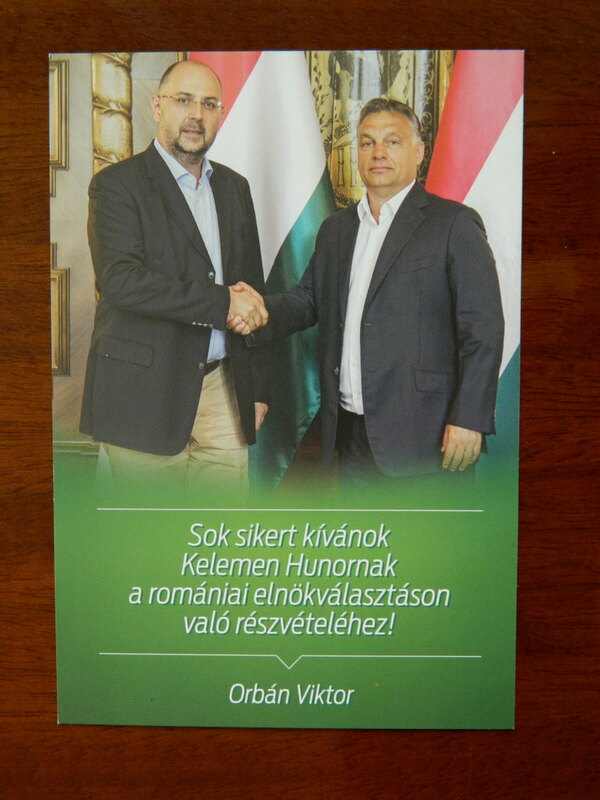 This entry was posted in Elections, Hungary, Politics, Romania and tagged Viktor Orban. Bookmark the permalink. Of course I accept the results of democratic elections, but democracy also entails that there will be another election in four or five years. And Fidesz are acting in an undemocratic way by changing the playing field for the next elections, e.g. by changing the constitution, by exercising control over the media and thus preventing an open debate, by establishing or strengthening bodies outside of parliament (for example to control the media or the central bank) and staffing them with Fidesz people only. Democracy does not require that I accept the will of the majority, it just means that if I am in the minority that I am not as influential in making decisions over the next couple of years. Democracy is not a boxing match where one side gets knocked out. And democracy does not give 60% the right to disregard the remaining 40% of a country completely. And I am blaming everyone who voted for Fidesz and Jobbik. I am blaming everyone who is nationalistic and who puts talk of god, fatherland, nation above economic and social policies. I am blaming everyone who prefers this anachronistic talk over liberal European values. Democracy does not mean that I need to respect stupid opinions just because there are more stupid than smart people (to put it a bit provocatively). And I also find this idea of a “Greater Hungary” quite weird/dangerous, with Orban traveling around Europe and rousing nationalistic sentiments in neighboring countries. It’s Europe and anyone can move where they want. This idea of fixed borders and national identities is rather outdated. Your use of a dictator as a benchmark for judging Viktor Orbán is quite telling. wow, then, you have to blame 80% of the hungarians :-) as the rest of them voted for Jobbik and for the next elections not the left which, praise God, is dead forever in Hungary, but the Jobbik is going to win the elections. I understand you are fighting for their rights ? :-) Anyway, every nation has the right to rule it’s destiny as find it appropiate. Hungarians were the first to raise against the Habsburgs before ‘848, then the first to raise against the communism in 1956 and now is the first nation to raise against this new, monstrous marxist monster, the UE. Orban declared that this is the end of the liberal democracy in Hungary, which we all hope it is going to be true in Romania also. Listen, we were not fighting against soviet communism to get some western marxism. Central and East Europe was and is always going to be nationalistic regardless that few fagots (there are always some) are telling you the opposite and beside all the efforts of Soros Open’s Society. Huge majority of the romanians, serbians, bulgarians, hungarians, ucrainians are deeply nationalsitic and this is not going to change. Pretend you are a bit supporting the far right in you country and a romanian about Antonescu at a beer, or ask a hungarian about Horthy, a croatian, serbian, etc. Yes, I agree that anyone can move in Europe and this is good. I am also traveling twice monthly between 2 different countries but you have to respect the “law of the land”. Multicultural society is dead as Frau Merkel hat gesagt. Because you mention “we were not fighting against soviet communism to get some western marxism,” I am curious to learn about your personal contribution to the fight against communism. I can’t speak about any decisive personal contribution in the fall of communism as I was only 16 in 1989. I refused to enter the communist youth organization twice in 1987-88, which was a huge affront that time when it was a matter of age not a matter of choice in doing so, but that did not contribute in any way to the fall of the system. I was also out on the streets on 21 December 1989 but like me were other tens of thousands only in Tîrgu-Mureș, but again, I can’t say I had myself any special contribution on something it had to happen any way. Fortunately, I was not where the other guys were shot dead. By the way, next time when you pass the city center think that the soldiers were standing in a line where is now the pedestrian crossing from the city hall (the yellow one, not the County Hall) to the Grand Hotel. The main group of protesters were just in front of them at 30-50 m, where is the main entrance of the Romarta One shopping center. I was standing just next to the building of Grand Hotel, to close to soldiers and not right in front of them to be shot. I still remember watching them kneeing down, taking the firing position and firing straight into the people. (the rifles were horizontal – they were not firing in the air as pretending now). I still remember later on, in 22 night, after Ceausescu left and the people entered and vandalized the Communist Party local headquarter (now the County Hall) during the day, walking on a thick layer of red books (lenin, marx, works and directives of the communist party, bla-bla) thrown out on the windows by the protesters, covering completely Primăriei street (just between the City Hall and the County Hall) I was walking alone on that small street late in the night as the crowd slowly returned home watching the TV (first day of Free TVR, terrorists, revolutionaries taking over, huge emotions) and despite being so young I felt that I am living a unique moment which I will never forget. It was the end of half century of communism, with it’s mad ideology (like every ideology) laying now just bellow my feet. I was smiling and crying together and I wished my grand-grandparents who were imprisoned by the communist, my grandmother as well, my mother who was at that time a political refugee in Germany, and all the prewar right wing politicians, killed in the communist prisons, could see me walking on all those mad dogs writings. So, it was not my merit, I had no contribution but I was very happy to be so lucky to live those days. There are millions of other stories like this in Eastern Europe. Therefore, there is no more room for ideology of any kind on this side of the world, regardless it is coming from the East or from the West. Thank you for that personal account! I was 14 at the time and remember it as the most interesting Christmas. Watching the overthrow of Ceauşescu on TV (I lived in Germany at that time) was definitely more interesting than any family dinner.